Indians were 12-0 in conference play last season and play a tough trapping defense. Carly Bolivar has spent the last three years driving with force to the rim, creating chances for her teammates and making life difficult for the opposition’s top scorer. This season, Bolivar is ready to put it all together and lead Sewanhaka on a run at the Nassau Class A title. The senior guard keys the Indians’ trap-heavy defense and averaged 18 points last season on a team that went 12-0 in Nassau A-II play and earned the No. 2 seed in the county before a disheartening loss to Locust Valley in the first round of the county playtoffs. She is one of four starters back from that squad, as is point guard Flo Hunte, who complemented her own playmaking skills by averaging 12.7 points. Traditional powers and last season’s county finalists, Elmont (the reigning state runner-up) and North Shore both graduated a ton of talent, which should translate to a competitive title race. What could set Sewanhaka apart is its commitment to aggressive defense. On offense, Bolivar excels at driving to the rim, but opponents could pay for packing the lane to stop her, thanks to the Indians’ outside shooting. This includes Hunte, who also plays a pivotal role in leading the team’s fast-paced offense. Soupios said that Hunte has grown into a more well-rounded player from one who was primarily focused on offense. The versatile Jessica Williams also will start on the perimeter, while forwards Mia Weinschrieder and Ashley Cattle will help the Indians control the boards. Plainedge boasts an experienced backcourt of its own that should also help the Red Devils contend. Sharpshooter Lauren Krystall is expected to lead the way, along with Ashley Lindsay. Elmont and North Shore both remain in the mix for another run at the county title, and Wantagh, Division and Island Trees should also be in the hunt. Kaia Harrison is back to lead a Baldwin team that is looking to repeat as Federation champions and win a third consecutive public school state title. The Wake Forest-bound point guard scored a team-high 15 points in the Federation championship game against Christ the King and averaged 10.1 points last season. Elena Randolph provides a rebounding edge and solid interior defense and is joined in the frontcourt by the athletic Jamiela Moore, and guards Alexis Aponte and Mariah Benavides bring a double dose of outside shooting. Syosset, Massapequa and Freeport are the Bruins’ leading challengers. 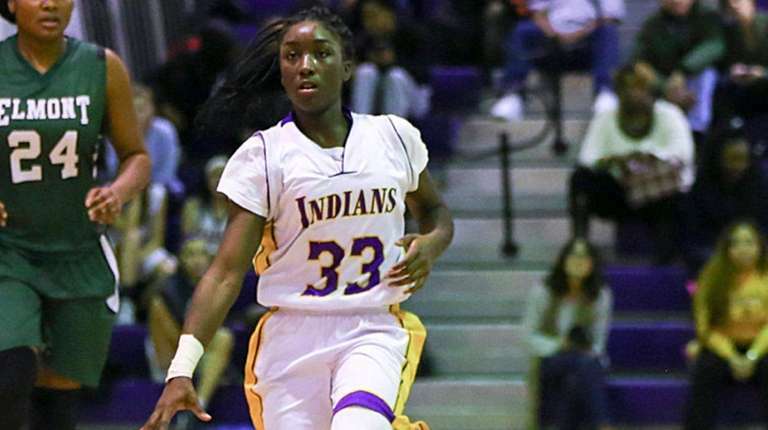 Carle Place won the Long Island championship last season but this year’s Frogs team could be even tougher, thanks to the return of point guard Leah Burden. She missed the last three months of last season after undergoing ACL surgery, but the senior is back, along with most of the other key components from the title-winning team. These include forward Abby Selhorn, center Caroline McLaughlin and guards Giana McKeough and Erin Leary.